Published July 21, 2016 By Anna T. This post may contain affiliate links. Regardless, I only recommend sites I've researched and/or used and trust. I remember back in 2010 when I first started this blog over on Blogger. I didn't pay for anything. Blogger was completely free, so I just created an account and started writing. Those were the days! But the great thing about blogging is that it is completely possible to start for free or very cheap, and only begin paying for different things to help make your blog more efficient as you generate an income and are able to afford it. That's what I did. I didn't pay for much of anything until my blog was generating enough income to cover those things. So today, I wanted to share with you a list of the blogging tools I've chosen to pay for, that I think are worth paying for. And if you're a new blogger who can't quite afford to invest much money yet, you'll be happy to know that many of the tools I'm about to list come with FREE versions that don't cost a thing! I use Liquid Web as my web host. When I first signed up for web hosting, I was on a shared server through Hostgator, but I moved once my traffic began increasing so that now I have a dedicated server (meaning only my sites are on my own server). Dedicated hosting is better if you have a high-traffic blog. Liquid Web's cheapest plan is about $1.62 per day. If you have a blog that gets over 100,000 page views per month, you may want to check into Liquid Web for yourself. If you're a new blogger without much traffic yet, shared hosting is usually just fine. I have instructions here on setting up with SiteGround. You'll pay around $4 a month for a hosting plan on a shared server. If you want to blog professionally and ultimately earn an income with your blog, I don't recommend using Blogger or any other free site. I didn't have a newsletter set up for my blog for almost two years after I started it! I really regret that because I'd have way more subscribers now than I currently have. It's important to start collecting the emails of people who visit your blog not long after you set it up. Keeping in touch with your readers via email helps ensure they become loyal followers who will visit again and again. ConvertKit is my newsletter service provider. I like them because they make it possible for me to create custom opt-in bonuses for different types of blog posts, and I can also tag subscribers with different interest categories depending on what links they click within the emails I send them. Plus they let you create an unlimited number of forms, landing pages, send unlimited emails, etc. Their cheapest plan is $29 a month for up to 1,000 subscribers. If you're a new blogger, you can definitely get by with MailChimp if you don't need a lot of those extra features yet and are looking for a service that's free. You don't pay anything if you have 2,000 subscribers or less. If you sign up for ConvertKit and feel confused on learning how to use it, Suzi Whitford of Start a Mom Blog has an e-course just for ConvertKit newbies that should help you! There are a lot of free social sharing plugins for WordPress, and I got by for years using Shareaholic and the buttons that come with the Jetpack plugin. However, I was told by the folks over at AdThrive who manage my ads that those sharing plugins were contributing to super slow website speed for me, and that I should find something else. I did the research, and Social Warfare is one of the best, most lightweight social sharing plugins out there. It doesn't slow your site down at all. Plus, they have a neat little popular posts widget you can add to your sidebar. In addition, there are features that allow you to specify the exact images you want used for Facebook and Pinterest, plus a field where you can type in a customized tweet for Twitter on every post you write. Social Warfare costs $29 a year for the cheapest plan (which is what I have). Don't want to pay for it? You can still download the free version in WordPress and get some limited features. A big chunk of my traffic comes from Pinterest. I love Pinterest for sharing my blog posts because it makes it possible to start getting traffic back to them almost as soon as they are published. No waiting on Google to index anything and rank it up like we had to do in the “old days.” You fellow pre-Pinterest bloggers will know exactly what I'm talking about! But doing well on Pinterest means being active consistently. You can't just write a new post, pin it, and then don't come back to pin anything else until you write another post. Pinterest will reward you if you're sharing your blog posts regularly (all of them, not just your new ones) and also pinning the content of other bloggers. To do this, I use a Pinterest scheduling tool. I use Tailwind to pin the content of others, schedule out my new pins for new blog posts using Tailwind's Board Lists and scheduling intervals feature, and also for their new Tribes feature where you and other bloggers in your niche can be part of a tribe and post pins you want each other to share. Tailwind offers a free trial for up to 100 pins, then after that you'll pay $9.99 a month for their cheapest plan. This is something new I just recently started using. It's a small pop-up that appears in the lower right hand corner of your site, inviting people to follow you on Pinterest and Facebook. It rotates between those two. And there is a cookie set so that if someone closes it and doesn't want to see it, it won't show back up for them for however many days you specify. I really like it, and have been seeing my Pinterest and Facebook followers grow at an increased rate thanks to it. I'm not an Instagrammer, but if you are, you can also use MiloTree to grow your followers there, too. MiloTree is $9 a month. OptinMonster is a tool that can integrate with your newsletter service provider (it works well for me with ConvertKit) that you can use to make really nice, attractive opt-in forms to collect subscribers. I use it for the opt-in lightbox that appears on my blog as well as the sidebar “Subscribe Now” form. It's really easy to use. I can create forms very, very quickly and have them in place on my site with the click of a button through their plugin. Since using it, I've seen a substantial increase in subscribers compared to what I was getting just using the Plain Jane forms ConvertKit provides out of the box. OptinMonster will cost you between $9 and $29 a month just depending on which plan you choose. For me, PicMonkey and Pinterest just go hand in hand. If your blog post images are going to do well on Pinterest, it helps for them to be dressed up a bit with some text so people will have an idea what they are about. If it weren't for PicMonkey, all my pinnable images would just be of computers and people typing. This would not be effective on Pinterest because it wouldn't tell anyone what my blog posts are about. PicMonkey is a tool you can use to upload your images and then dress them up with different texts and overlays to make them more eye-catching. The image you see in the upper right of this blog post was edited by me with PicMonkey. PicMonkey is $7.99 a month. If you sign up and don't understand how to use it, you can go through this free, short e-course on learning to use PicMonkey for your blog images. So that basically sums it up! 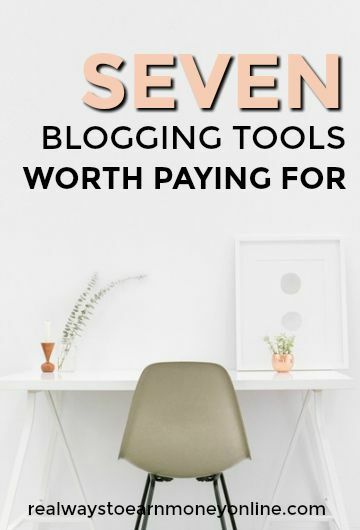 The 7 blogging tools that are worth paying for. Now it's your turn. I'd love to see what blogging tools you think are worth paying for. Since then I’ve been using WordPress. Penny wise and pound foolish – that’s what it taught me. It’s a paradox: stop saving on blogging tools and you’ll earn more money. That’s why I use paid blogging platform and paid content creation tools (BuzzSumo, Yoast SEO plugin, Unplag plagiarism checker, Iconfinder and Trello are definitely worth paying for). Thank you Anna for the useful tips! Hi, Thank you so much for all the information. I was just wondering though, why do you suggest not using the free blogger? That is what I use right now only because im not really making much to cover anything else but am wondering actually how I can start making more… Thanks! Hi Jennifer, I explain why in this post – http://realwaystoearnmoneyonline.com/should-you-start-a-blog-on-a-free-site/ But to sum up, it’s primarily because you don’t really own your own property with Blogger. There are several reasons, but the main reason is that they can take your blog down for any reason at all, at any time. Another work at home blogger I know had this happen to her. They deleted years of content that she was never able to get back, and they offered her no explanation and ignored her emails. So it’s risky if you’re wanting your blog to be more than just a hobby. If you’re brand new and just learning the ropes, it’s not a big deal to start there just to see how you like blogging. But if your blog starts making more and more money at any point, you might want to consider moving to self-hosting. I use most of these tools as well for myself or clients. They’re great! I also like Befunky.com for photo/image editing. I’m going to have to look into Milotree. I love that it rotates. Thank you for the info! You’re welcome! Glad you enjoyed it, and I hope whatever you choose to use helps you out. Anna, thank you so much for posting this! I’ve been hearing about ConvertKit and Warfare Plugins. I’m definitely going to check them out. Thanks again! I highly recommend them both, they’re awesome! Thanks for stopping by! Like they say sometimes you have to pay to play. Free tools are great but in most cases it’s the ones you actually have to pay for that make all the difference. Thanks for the eye opener!